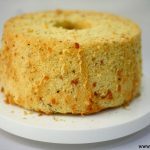 Ever heard of a Ham and Cheese Chiffon Cake? No? Ewws? A Savory Cake? Weird might be your reaction to the sound of this. I won’t blame you as I personally felt the same way when I saw somebody posting on this. After having tried a ton of Pandan Chiffon Cakes or more correctly ( Sweet Chiffon Cakes recipe), this might be a good change after all. The title says it all. This was going to be a savory chiffon cake made with the following ingredients: Ham, cheddar cheese, Mozzarella cheese and Italian herbs. What’s breakfast without ham and cheese right? If I had to sacrifice 2 meals, that would be lunch and dinner. Here goes the saying that skipping breakfast is unhealthy, or you should never skip breakfast as it’s the first meal that gives you energy to start off a busy day. Clichés or facts aside, I will rarely be seen skipping them. Firstly, my body alarm is adjusted to 7-7.30am daily (I practically do just fine without an alarm clock or the need for me to snooze something). The time from 7 to lunch time is a pretty long time for someone like me to get hungry. Secondly , I love eggs, cereal, bread, pancakes, waffles, pastries, peanutbutter, confiture, nutella! !, yogurt, fresh fruits and basically anything diary. That basically sums up what breakfast comprise of. Anyway to cut the story short, it’s time to introduce the breakfast ham and cheese chiffon made of ham and cheddar cheese. The thought of it just sounds yummy (initially)! The chiffon texture was good and the combination of cheese + ham works but hmmm it sort of reminds me of pancakes and bacon- a very popular way of combining sweet and salty haha but it’s either you like it or loathe it… It all depends on the individual. If you’re daring enough, do give it a go and tell me whether it’s a nay or yay! Place egg yolks, water and oil in a mixing bowl and use a handheld electric mixer to mix till incorporated. Add in cake flour and mix till smooth. Gently fold in 1/3 of the egg whites mixture into the egg yolks mixture. Then another third and then the last third until mixture is well combined. Pour mixture into the chiffon tin and bake for 40-50 minutes. Remove cake from oven and overturn to cool completely.